Athletes have used heart rate training successfully for many years. However, slavish adherence to heart rate training zones will not allow an athlete to reach his or her true potential. It is claimed that today's heart rate monitors can perform all sorts of wonders, from predicting maximal oxygen uptake to detecting overtraining. Some heart rate monitors can be used to predict VO2 max (maximal oxygen uptake). For example, it has been shown that the Polar S810 heart rate monitor can accurately predict VO2 max, which is a strong predictor of endurance performance and the best measure of health-related fitness. In different tests, most participants' estimated VO2 max scores were within 5ml/kg/min of their directly measured scores (Chien 2000). The Polar S810 predicts VO2 max from age, height, weight, gender, self-reported physical activity level, and resting heart rate measurements. Strict adherence to testing procedures is required because, as the manufacturer acknowledges, a number of factors influence resting heart function, including noise, temperature, time of day, diet, alcohol, smoking, exercise, and pharmacological stimulants. Be aware also that self-reported physical activity level is prone to error. It is also noteworthy that the heart rate monitor penalises the 'fat fit' by expressing VO2 max relative to body weight. When we directly measure maximal oxygen uptake in the lab, we express the results relative to body weight and independent of body weight (millilitres of oxygen per kilogram of body weight per minute and litres of oxygen per minute, respectively). A reduction in heart rate for a given intensity is usually indicative of an improvement in fitness. In our experience, previously inactive individuals and those returning from a period of injury are often delighted to see a reduction in heart rate for a given intensity after only four weeks of aerobic training. Trained individuals are unlikely to experience discernible reductions in submaximal heart rates and improvements in fitness are best identified from changes in the blood lactate response to exercise. In normal individuals, there is a linear relationship between heart rate and intensity during incremental exercise (Cooper 2001). Therefore, exercise intensity can readily be expressed as a percentage of predicted or directly measured maximum heart rate. The near linear relationship between heart rate and oxygen uptake is such that exercise intensity can also be expressed as a percentage of VO2 max. Maximum heart rate (HRmax) is best determined in a graded exercise test, but a maximal exercise test can be inappropriate, especially in less well-trained individuals. Maximum heart rate can be predicted from the formula 220-age, from the formula 210 - (age x 0.65), or from the formula 207 - (age x 0.7); however, all predictions are subject to error (Gellish 2007). The variation in heart rate among the normal population is such that the predicted maximum heart rate of 95% of individuals of a given age will lie within a range of 40 beats/minute (Cooper 2001). The relationship between oxygen uptake and heart rate can be predicted more accurately when oxygen uptake is expressed as a percentage of heart rate reserve (HRR), the difference between maximum heart rate and resting heart rate (Swain 1997). Heart rate monitoring allows individuals to train at the intensity recommended for improving aerobic fitness, which is 50-90 % of the maximum heart rate (HRmax)(Pollock et al. 1998). Too many athletes do not reach their true potential because they adhere to ill-conceived heart rate training zones. Untrained individuals will enjoy improvements in fitness at 50% of maximum heart rate (HRmax). Trained individuals require more individualised exercise prescription. Training zones are best determined by the blood lactate response to exercise. The figure below shows the blood lactate response to incremental exercise in a 46-year-old club cyclist. 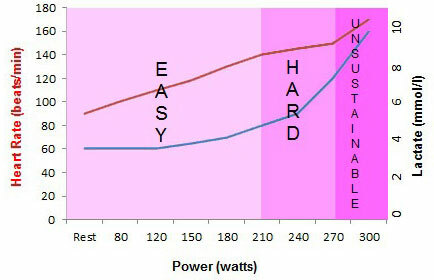 Notice that blood lactate does not increase above resting levels until power output reaches 210 watts. In this individual, exercise up to 210 watts is comfortable, sustainable, and ideal for long duration or recovery training. As exercise intensity increases, the cyclist recruits more fast-twitch muscle fibres and produces more lactic acid. From 210-270 watts, the cyclist's increased breathing is sufficient to expel CO2 and buffer blood lactate. In this individual, exercise at 210-270 watts is difficult, but it will improve his/her ability to tolerate and dispose of blood lactate. At 270 watts, there is a rapid rise in blood lactate concentration. This is known as the 'lactate threshold'. Exercise beyond the lactate threshold is ideal for interval training, however. In runners, we often prescribe exercise intensity around the speed at lactate threshold rather than the heart rate at lactate threshold. In runners, cyclists and all athletes it is important to stress that there is no predictable relationship between heart rate and lactate threshold. Lactate threshold tends to occur at around 90% of maximum heart rate in well-trained individuals, but it can occur at 50 to 90% of maximum heart rate (Bouchard 1982). Borg's rating of perceived exertion (RPE) scale (Borg 1998) can also be used to determine exercise intensity outside of the lab because an RPE of 13-14 often occurs at the lactate threshold, regardless of gender, mode of exercise, and training status (Guskiewicz 1997). Many individuals will find RPE too subjective and will be reluctant to train without a heart rate monitor. Overreaching is characterised by signs and symptoms that last from a few days to two weeks, including fatigue, muscle soreness, insomnia and underperformance (Halson et al.2004). Overreaching is often utilised in a training cycle because 'super-compensation' may occur after an appropriate period of recovery (Spurway 2006). It is thought that fatigue, performance decline, mood disturbance and other symptoms are more severe in the overtrained state than in the overreached state (Halson et al. 2004) . An athlete may take months or years to recover from overtraining. Some top-of-the-range heart rate monitors can detect a 5-10 beat/min increase in resting heart rate and a decrease in resting heart rate variability which might be early signs of overreaching and overtraining (Halson et al. 2004). There is increasing evidence that heart rate variability is lower at rest in the overtrained state, but there is no diagnostic tool for overtraining; the condition is 'diagnosed' by excluding all other explanations for the decline in performance and mood (Halson et al. 2004). Heart rate monitors can be used to estimate VO2 max, to identify changes in fitness, and, possibly, to detect the early signs of overtraining. Heart rate training zones are meaningless unless they are identified from the blood lactate response to incremental exercise. Heart rate training is particularly inappropriate during interval training. Most well-trained individuals do not need a heart rate monitor to know what constitutes an all-out one-minute interval, an all-out 5-minute interval, or an easy recovery interval. The information on this page is adapted from O'Donovan & Denis (2007) with the kind permission of Electric Word plc.